BAGHDAD (AP) — A year after it was routed from Iraq in a devastating war that left entire neighborhoods and towns in ruins, the Islamic State group is fighting to hang on to its last enclave in eastern Syria, engaging in deadly battles with U.S.-backed forces. Cornered in the desert near the Iraqi border with nowhere to run, the militants are putting up a fierce fight, inflicting hundreds of casualties among their opponents and releasing a stream of beheading videos reminiscent of the extremist group’s terrifying propaganda at the height of its power. In Syria, the battle for the area of Hajin has dragged on for three months, highlighting the difficulty of eradicating an extremist group determined to survive. Across the border, in Iraq, there is rising concern that the group may stage a comeback. IS sleeper cells have recently launched deadly attacks against security forces and abducted and killed civilians, mostly in four northern and central provinces that were once part of the group’s self-declared caliphate. “There is still major danger for Iraq and Syria especially in areas close to the border when it comes to Daesh,” a senior Iraqi intelligence official said, using an Arabic acronym to refer to the extremists. He spoke on condition of anonymity because he was not authorized to speak to the media about security matters. Iraq’s then-Prime Minister Haider al-Abadi declared final victory over the group on Dec. 9, 2017. 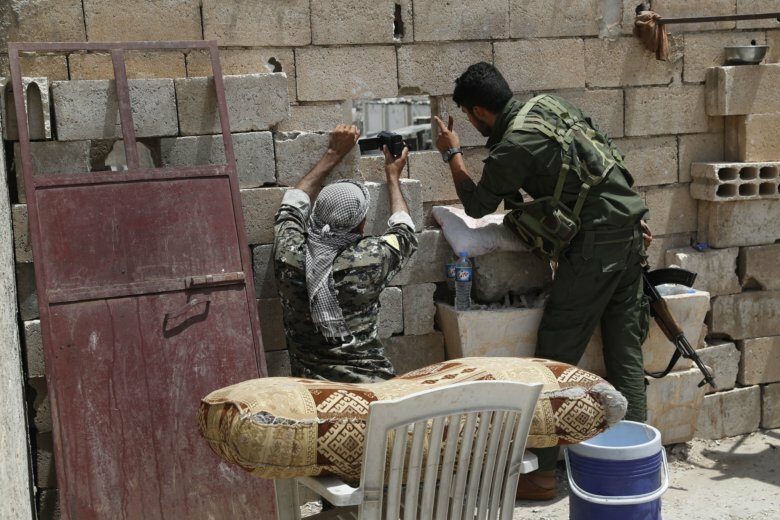 Two months earlier, the coalition, working with Kurdish-dominated fighters known as the Syrian Democratic Forces, liberated Raqqa after a bombing campaign that decimated much of the city. “It is very difficult because we are in the last stages, where almost every ISIS fighter is a suicide belt,” Brett McGurk, the White House envoy for the war against IS, said at a security conference held recently in the Gulf nation of Bahrain. The fall of Hajin will end the group’s hold over any significant territory in Iraq or Syria, but sleeper cells in both countries will continue to stage attacks amid attempts to regroup. IS affiliates in Libya, Afghanistan and Egypt’s Sinai Peninsula continue to stage regular attacks. The group’s savage legacy, meanwhile, will stay on for years to come. Huge parts of Iraq and Syria are still in ruins, with little cash and — in Syria’s case — little international political will to rebuild. Emerging from the more than three years of war, Iraq estimates that $88.2 billion is needed to rebuild the country. An international donors’ summit held early this year in Kuwait gathered pledges of $30 billion that mainly came in the form of loans, but no progress has been made to fulfil the pledges. “The biggest problem we have is the lack of funds,” said Mustafa al-Hiti, the head of a government-run reconstruction fund. “What we spent till now is about 1.5 percent of what we need and that came as loans and donations,” al-Hiti added. Nuri Mehmud, an SDF spokesman speaking by telephone from Syria, said all of IS’ experienced fighters are now in the besieged area of Hajin. “It is a difficult battle but in the end we will wipe out Daesh,” he said. Mroue reported from Beirut. Associated Press writer Sinan Salaheddin in Baghdad contributed to this report.